With Windows 8, you can sign in to your PC with a Windows Live account. This allows syncing and sharing personal data across multiple devices very easily. You might also be wondering, “How to log on the computer if I forgot my Windows Live password?” Well, here is a excellent hack for you. With Password Recovery Bundle utility you can create a bootable password reset CD, and set your computer to boot from the CD and it enables you to reset forgotten Windows Live password which is stored on your local computer. After resetting, you will regain full access to your PC with a new password. How to Reset Forgotten Windows Live Password in Windows 8? First you need to download Password Recovery Bundle program on another computer. After installing and running the program, click the Windows Password button, which allows you to create a bootable password reset disk in 3 steps. Insert a blank CD/DVD or USB drive into the computer and click Start Burn to create a bootdisk. Insert the password reset bootdisk you’ve created into your Windows 8 computer. Turn on the computer and hold down F2 or whatever the setup key is shown as during the initial boot screen. This should bring up the BIOS. Restart the computer and now it will boot from the password reset bootdisk. 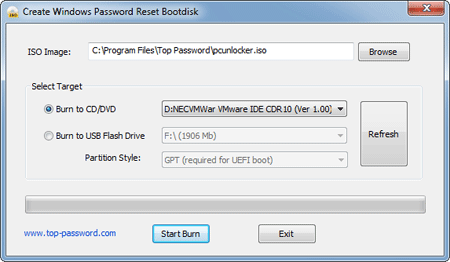 After one or two minutes the bootdisk will launch the Reset Windows Password utility. Choose the local user account which is linked to your Windows Live ID, and then click Reset Password button. The program will set your Windows Live password to Password123 instantly. Now remove the password reset bootdisk and restart the computer, you can then quickly sign in to Windows 8 using your Windows Live account and the new password: Password123. Password Recovery Bundle could also reset forgotten login password in Windows 7/Vista/XP/2003/2000. It should be the first Windows password recovery program which supports the latest operating system Windows 8. If you plan to set up a Windows 8 system to be shared by more than one person, you’ll want to know how to add a second user account. As with many aspects of the Windows operating system, things have changed in Windows 8, and you’ll have to learn how to get around in the new OS. 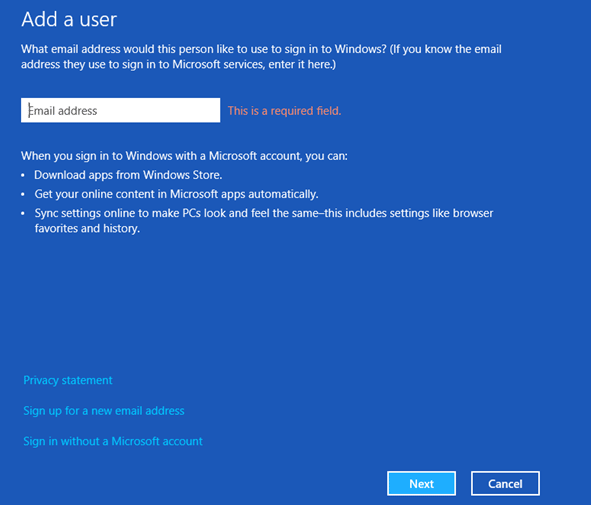 This tutorial will explain the process involved for creating a new account in Windows 8 for an individual with a Microsoft account, and someone who just wants to use a local account. 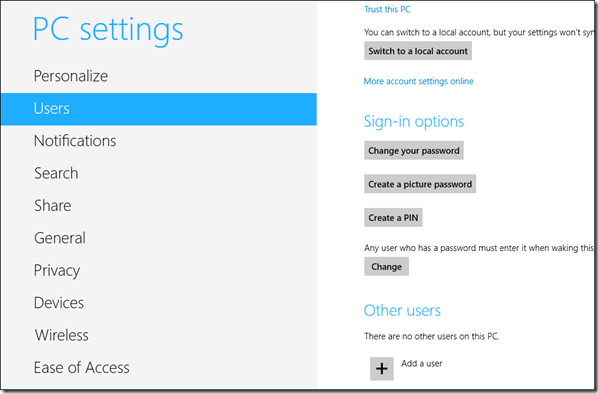 How to Add a Local or Microsoft Account in Windows 8? Slide your cursor to the bottom-right corner of the screen to activate the Charms and click the Settings. 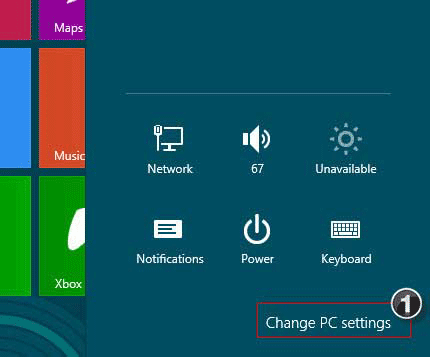 click on the option Change PC Settings to open Windows 8 PC Settings. When the PC Settings menu loads, click on the option Users and select the option Add a user located at the bottom. Windows 8 will start the new user creation wizard and will ask you to provide an email address to create a new online Microsoft account for the new user. If you don’t want to go for an online account click on the option Sign in without a Microsoft account and continue. If you go for an online account you will have to provide your email address, security questions and other important details like address, date of birth, etc. Local account does not require much of these details and takes just a few minutes to complete the process. After the account is added successfully, you will be able to sign in to Windows 8 using your newly created local account or Microsoft account. So that was how you can add a local or Microsoft account in Windows 8. Afterwards you can switch from Microsoft account to local account or switch from local account to Microsoft account, which depends on your choices. Safe Mode is a special boot mode available in all versions of Windows, which is mainly used for troubleshooting purposes. Many times when you can’t boot into Windows because of a virus infection, a faulty software or driver installation, you can boot into Safe Mode and fix the problem. While in Safe Mode, only basic files and drivers absolutely necessary to run the operating system are loaded. Graphic drivers are among the dispensable ones and do not load, hence Safe Mode looks rather bleak. However, because just the essential programs and files are loaded in Safe Mode, this allows us to remove some spyware, hardware, viruses and such that cannot be removed in Normal Mode. This article explains how to start Windows in Safe Mode. Note that you will need an Administrator account in order to log into Safe Mode. If you forgot the administrator password, please reset the password first using Reset Windows Password utility. Press and hold the F8 key while you wait for the Windows logo to appear. If the Windows logo appears or if the operating system begins to load, you may need to restart the computer and try again. 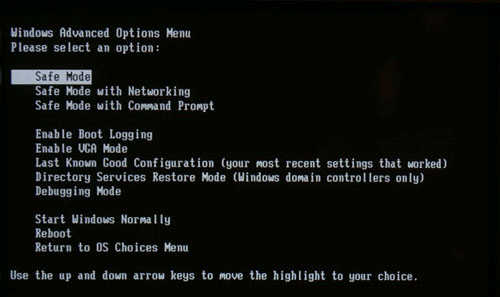 The Advanced Boot Options screen for Windows will appear. Use the arrow keys on your keyboard to select Safe Mode, and press Enter key. Windows will boot into Safe Mode. When the desktop appears, it will display ‘Safe Mode’ in all four corners to let you know that you’re in this special mode. After booting into Safe Mode, you can scan your system with antivirus, uninstall faulty software or driver which you’ve installed recently so you’ll be able to boot into Windows normally without any problem. How to Change Windows 8 Product Key? Do you need to change your product key so you can activate Windows 8 properly? After installing Windows 8, you’ll find that there is no option to enter a product key under Computer properties. Or, at least I did not see it. Luckily, the good old Command Prompt and slmgr.vbs tools came to rescue. Just follow this tutorial to change Windows 8 product key using Command Prompt and slmgr.vbs. Move the mouse cursor to the bottom right corner of the screen, click the Search icon. 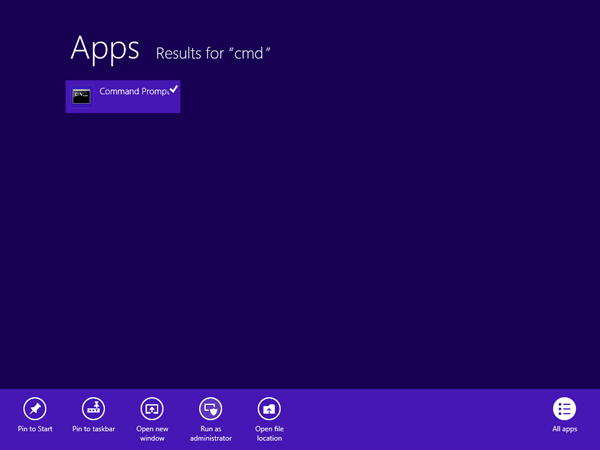 Type in cmd in the search box, then right-click on the “Command Prompt” icon on the top-left of the search result page. A tick sign appears on the icon. Click on the Run as Administrator icon from the bottom options. You will get a confirmation on product activated successfully. Network administrators change the administrator account password often to provide an extra level of protection for the account. The administrator account is a target for hackers, because it has complete control over the network. But frequently changing the administrator password can also cause losing it easier. What to do if you forgot the administrator password on a domain controller? In this tutorial we’ll demonstrate how to reset a forgotten administrator password on a Windows Server 2010/2008/2003/2000 domain controller, if you forgot the administrator password and can’t login using any other alternative administrative accounts. How to Reset a Forgotten Administrator Password on a Domain Controller? Launch Password Recovery Bundle and click on Windows Password button, it will display a password reset bootdisk creating dialog. Choose the CD you’ve plugged in and then click on Start Burn button to create a Live CD. After you have the Live CD, put it into the CD drive of your domain controller. Turn on the server and have it boot from the Live CD. You may need to go into BIOS and set CD/DVD as the first boot device. Choose the administrator account from the list, then click on Reset Password button, the program will replace the forgotten/unknown administrator password with the new password: Password123. Reject the Live CD and reboot the domain controller, you can then log in to the administrator account with the new password. No need to format the hard drive and re-install your domain controller. We’re glad to see that parental controls in Windows 8 are simple and not nearly as complex as previous versions of Windows parental controls. It is much easier for all parents out there who want to protect their kids while they are using their computers. Parents can set up parental control to set limits on the hours that children can use the computer, the types of games that they can play, the websites that they can visit, and the programs that they can run. 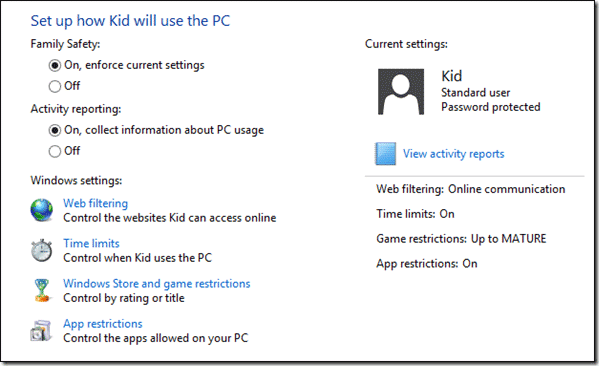 How to Set Up Parental Control in Windows 8? The key to using parental control in Windows 8 is to properly configure multiple accounts on your PC. You, as a parent you should have access to an administrator-level account. You need to set up a standard user account for your children as only this type of account can have parental controls applied. Step 1: Move the mouse cursor to the lower right corner of the screen and then right-click to bring up a small menu. The menu gives you quick access to some common administrative tasks, including Control Panel. Step 2: Open Control Panel and then open Family Safety. In family safety, click on the account you would like to configure and proceed. You will now have to configure some of the settings like Web Filtering, Time Limit, App restriction and, Windows Store and game restrictions. Step 3: As all the settings are similar to Windows 7 and Vista, you can refer to our complete guide – How to Use Parental Controls in Windows 7. The article shows you how you can allot time limit, moderate games and apps and filter inappropriate websites. Finally at the end of the day you can view your kid’s activity log and see how he has spent his time on the computer. That’s it. Keep in mind that if you have more than one PC that you allow your child to use, you might want to consider setting up an online Microsoft account for them. You can use local accounts, but you’ll probably have to set up their Family Safety settings for every PC, rather than just once with a Microsoft account. Normally the account lockout duration setting determines the number of minutes a locked out account remains locked out before automatically becoming unlocked. If the account lockout duration is set to 0 minutes, then a locked out user account will be locked out until you manually unlock that locked out user account. What to do if the locked out user account is the only one administrator account on your computer? You’ll be locked out of your machine permanently if you can’t find some password-unlocking tricks to solve this particular problem. In this post we’ll show you how to easily unlock a locked out user account in Windows 7, in case you are locked out due to invalid logon attempts or just simply forgot the password. 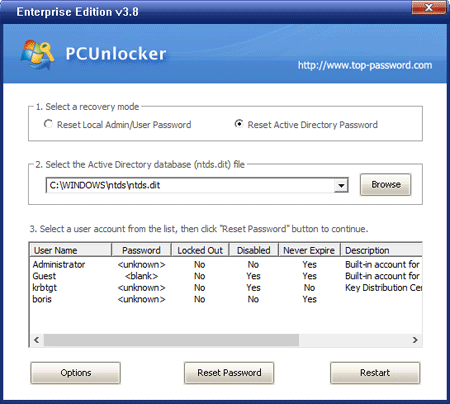 How to Unlock a Locked Out User Account in Windows 7? After a while the bootdisk will launch the Reset Windows Password utility, which shows all user accounts existing in your computer. Choose the user account which is locked out, then click Reset Password button. The program will reset the password as well as unlock the user account. Remove the CD or USB stick. Restart the computer and you can then log in to your Windows 7 user account with a blank password. This trick could also be used to unlock domain user account in Windows Server 2010, 2008,2003 and 2000. If you are someone who uses more than one computing devices (desktop PC, laptop or even a tablet), do you find it irritating that you have to make separate personalization settings on each device? Microsoft has introduced a sync feature in Windows 8 that allows you to solve this particular problem. 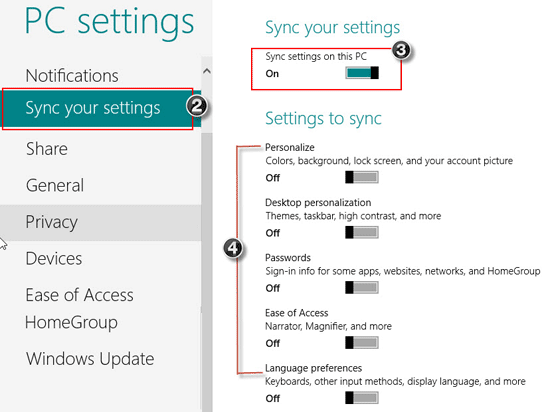 You can sync all your settings and data across multiple Windows 8 computers. If you want to enable synchronization feature in Windows 8, you will need to use your Microsoft account instead of the local Windows account to login to Windows 8. Since Microsoft account is connected to the cloud storage of SkyDrive, you will be able to use the free storage of SkyDrive. In this tutorial, I’ll show you how you can synchronize your PC settings in order to get a consistent and familiar environment on each of your devices. 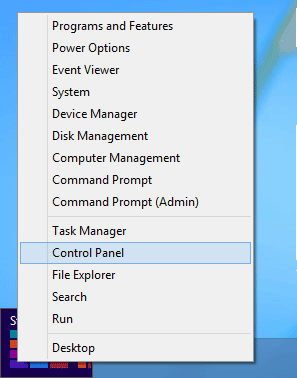 How to Sync PC Settings in Windows 8? 1. 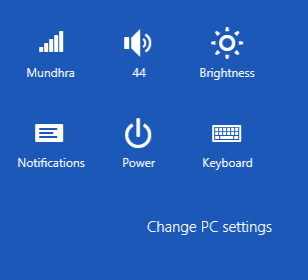 Bring the PC Settings interface by pressing Windows + I and click Change PC Settings. 2. Once in PC Settings, navigate to Sync Your Settings. 3. Enable the sync feature by moving the Sync settings on this PC button to the right of the screen. Under sync settings you can turn on/ off colors, background pictures, lock screen and your account display picture etc. You can have a look at all the options and enable / disable according to your requirements. 4. When you login with your Microsoft account in another Windows 8 PC, you will get the same settings and personalization that you get in your own PC. Windows 8 makes it possible to sync your PC settings between all the PCs and mobile devices you own that run Windows 8. Even if you just have one PC, it’s worth switching the feature on, as it backs up the settings to the internet via your Microsoft account. That way you’ve got a back-up if you need to re-install or restore Windows in the future. Chrome, like many popular browsers, includes a built-in functionality to save your password. Often we’ll use the saved password feature so we can login to the same website next time without re-entering your password. But we often tend to forgot the password when we need to login to the same website on another computer. Here’s how to find your forgotten password saved in Chrome. How to Find a Forgotten Password Saved in Chrome? 1. Download and install Password Recovery Bundle. 2. Run Password Recovery Bundle, then click on the Start Recovery button. It will bring up a drop-down menu that shows all supported password recovery options. 3. Select the Chrome Password option. 4. The Chrome saved logins and passwords will be revealed instantly. Password Recovery Bundle can be used on any Windows platform including Windows 8, 7, Vista, XP and if you have lost your passwords then you can use it to find your forgotten Chrome passwords easily. Forgot Windows login password? Or someone change the password on your computer and you can’t log in now? Password Recovery Bundle is the only risk-free solution to safely remove a forgotten Windows login password, so you can log back into Windows without losing any important files. What you need to do is download the software onto an alternative computer and create a password removal CD. Boot the target computer from the CD and it enables you to remove Windows login password easily. How to Remove Windows Login Password Which You Have Forgotten? 1. Download Password Recovery Bundle and save it onto an alternative computer. Install the software on the computer. 2. Start Password Recovery Bundle program and click on Windows Password button. This will bring up a new dialog which allows you to create a bootable password removal CD ( You can create a password removal USB drive if your computer doesn’t come with a CD/DVD-ROM ). 3. Set your locked computer to boot from the password removal CD. To boot from the CD-ROM drive, you may need to press a key such as F8 or F12 while your computer is starting up and set CD/DVD as the first boot device in BIOS. 4. After the CD boots, you will have a mini operating system loaded into memory which will launch Reset Windows Password utility. It will not install anything to your hard drive. 5. 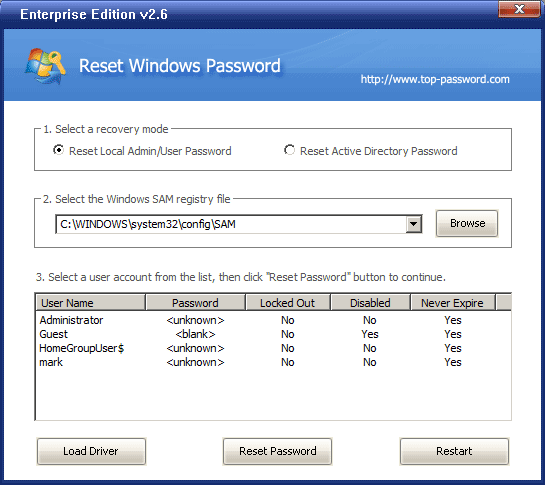 Click on the Reset Windows Local Admin/User Password option, the program will automatically detect the Windows SAM registry hive and local user accounts existing in your local computer. 6. Choose the use account whose password you want to remove, and then click on Reset Password button, it will remove your forgotten Windows login password in a short time. Take out the password removal CD and restart the computer, you’ll be able to login without a password. It’s essential to keep a password removal CD on hand for emergency situations, which allows you to remove Windows 8/7/Vista/XP login password quickly and easily.